March 23rd finally rolled around, and of course, like a true Hunger Game fan, I had already pre-purchased my tickets for the TOTAL IMAX EXPERIENCE. I wasn’t foolin’ around. The movie stayed true to the story line, and instead of having a running narative throughout the movie, the director cleverly had the events hosted by quirky Television Personality, Caesar Flickerman. It was an efficient way to show what was going on in the games and have Caesar explain the JabberJays to us, and other Capital and Panem secrets to us to better create the world that is Panem. The cast was incredible. Jennifer Lawrence is perfect as Katniss, and protrays a down to earth, deep troubled 17 year old girl seamlessly ( 😉 ). Peeta and Gale are exactly what I had imagined them to be. The movie did not fail to deliver on a great cast, I can give it that much. The cast actually makes up for where the movie lacks. Some characters were cut out of the story line completely, and some details were left out. The director might have thought it would have made for more efficient use of their hour and forty minutes, but we all know that Madge gave her the pin! Also, Peeta looses his leg, and they spend a lot more time in that cave then what the movie lets on. But that fact that they cut some characters out, even someone with a small role in the character development of Katniss such as Madge, didn’t bother as much as I thought it would. However, I did have a gripe about the presentation of the movie as a whole. I felt that it was lacking in its attempt to stir up and excite the audience with the use of a good score, or in another way musically. What I am trying to say is that I didn’t FEEL it. I feel Katniss’s pain when Rue died. 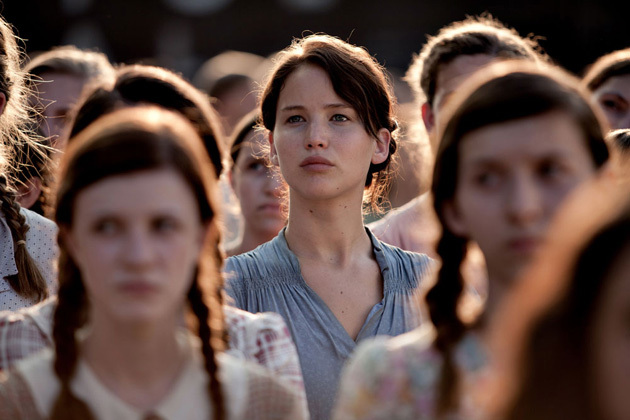 I didn’t feel it when Katniss found out that two tributes were allowed to win given if they were from the same district. I didn’t feel it when Katniss found Peeta camouflaged in the ground. And I definitely didn’t feel when Katniss and Peeta were about to eat Nightlock, and they annouce that the rules have changed once more, and they won! I just didn’t feel it. Music plays a big role in movies, and when I can hear someone three rows down chewing on their JUJU bees, then we’ve got a problem here, folks. Music evokes feeling within the audience and you can only get so far with a great cast. All in all the Hunger Games was not a huge failure like Twilight was. Hunger Games fans can rest assured that the movie stayed true the original story and gave what the fans have been dying to see. I give this movie 4 out of 5 stars. Tell me what you think ?